A nuclear crisis at the quake-hit Fukushima No. 1 nuclear plant deepened Tuesday as fresh explosions occurred at the site and its operator said water in a pool storing spent nuclear fuel rods may be boiling, an ominous sign for the release of high-level radioactive materials from the fuel. Tokyo Electric Power Co. said the water level in the pool storing the spent fuel rods at its Fukushima No. 1 nuclear plant's No. 4 reactor may have dropped, exposing the rods. The firm said it has not yet confirmed the current water level or water temperature in the pool and will try to pour water into the facility from Wednesday through holes that were created following an explosion earlier Tuesday in the walls of the building that houses the reactor. Unless the spent fuel rods are cooled down, they could be damaged and emit radioactive substances. The utility said it could not deny the possibility that the early morning explosion was caused by hydrogen generated by a chemical reaction involving the exposed spent nuclear fuel and vapor. Edano said water temperatures in the pools at the No. 5 and No. 6 reactors at the Fukushima plant have been rising as well. The agency said among the three, the situation is the severest at the No. 4 reactor because all the fuel rods are stored in the pool due to the change of the reactor's shroud. At the No. 5 and No. 6 reactors, up to one-third of the rods are being kept in the pools. The more fuel rods that are kept in a pool, the more radioactive substances could be emitted. To see why this is such an ominous development, let me provide some background. At the 40-year-old Fukushima Daiichi unit 1, where an explosion Saturday destroyed a building housing the reactor, the spent fuel pool, in accordance with General Electric’s design, is placed above the reactor. Tokyo Electric said it was trying to figure out how to maintain water levels in the pools, indicating that the normal safety systems there had failed, too. Failure to keep adequate water levels in a pool would lead to a catastrophic fire, said nuclear experts, some of whom think that unit 1’s pool may now be outside. “That would be like Chernobyl on steroids,” said Arnie Gundersen, a nuclear engineer at Fairewinds Associates and a member of the public oversight panel for the Vermont Yankee nuclear plant, which is identical to the Fukushima Daiichi unit 1. 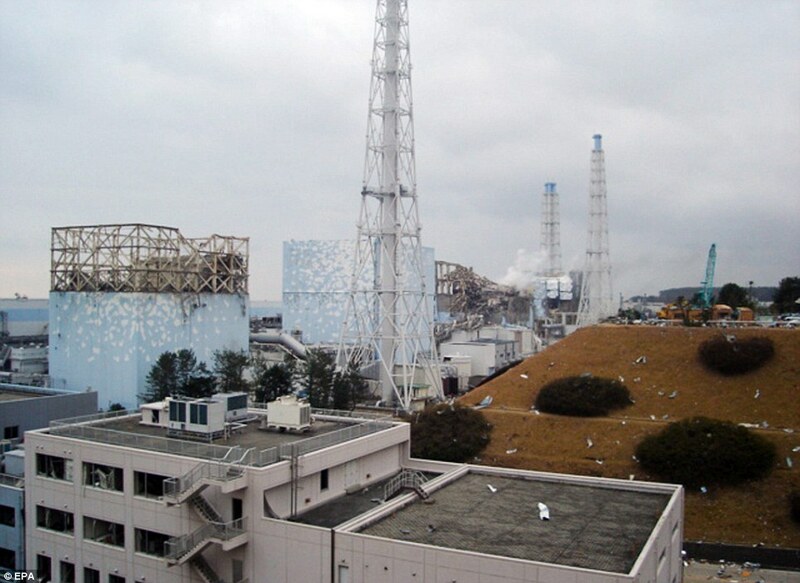 People familiar with the plant said there are seven spent fuel pools at Fukushima Daiichi, many of them densely packed. Gundersen said the unit 1 pool could have as much as 20 years of spent fuel rods, which are still radioactive. In some of the reactors - especially those to the right of the photo - the area in which the spent fuel pools are located appears to be severely damaged. (starting 10 minutes into video). A particular feature of the 40-year old General Electric Mark 1 Boiling Water Reactor model – such as the six reactors at the Fukushima site – is that each reactor has a separate spent-fuel pool. These sit near the top of each reactor and adjacent to it, so that cranes can remove spent fuel from the reactor and deposit it in a swimming-pool-like concrete structure near the top of the reactor vessel, inside each reactor building. If the hydrogen explosions damaged those pools – or systems needed to keep them cool – they could become a big problem. Keeping spent-fuel pools cool is critical and could potentially be an even more severe problem than a reactor meltdown, some experts say. If water drains out, the spent fuel could produce a fire that would release vast amounts of radioactivity, nuclear experts and anti-nuclear activists warn. "There should be much more attention paid to the spent-fuel pools," says Arjun Makhijani, a nuclear engineer and president of the anti-nuclear power Institute for Energy and Environmental Research. "If there's a complete loss of containment [and thus the water inside], it can catch fire. There's a huge amount of radioactivity inside – far more than is inside the reactors. The damaged reactors are less likely to spread the same vast amounts of radiation that Chernobyl did, but a spent-fuel pool fire could very well produce damage similar to or even greater than Chernobyl." But another scientist said while the spent-fuel pools have capacity for high volumes of radioactive material, the amount of fuel currently in the spent-fuel pool might be less than widely believed, based on data he has seen showing only about as much spent fuel in the vulnerable pool as contained in the reactor. If the spent rods start to burn, huge amounts of radioactive material would be released into the atmosphere and would disperse across the Northern Hemisphere. Unlike the reactors, spent fuel pools are not—repeat not—housed in any sort of hardened or sealed containment structures. Rather, the fuel rods are packed tightly together in pools of water that are often several stories above ground. “With damaged [fuel rod] pools, we are talking about things that were never considered a credible threat,” said Alvarez. Remarkably, that is the norm—both in Japan and in the United States. Spent fuel pools at Fukushima are not equipped with backup water-circulation systems or backup generators for the water-circulation system they do have. The exact same design flaw is in place at Vermont Yankee, a nuclear plant of the same GE design as the Fukushima reactors. At Fukushima each reactor has between 60 and 83 tons of spent fuel rods stored next to them. Vermont Yankee has a staggering 690 tons of spent fuel rods on site. Nuclear safety activists in the United States have long known of these problems and have sought repeatedly to have them addressed. At least get backup generators for the pools, they implored. But at every turn the industry has pushed back, and the Nuclear Regulatory Commission (NRC) has consistently ruled in favor of plant owners over local communities. After 9/11 the issue of spent fuel rods again had momentary traction. Numerous citizen groups petitioned and pressured the NRC for enhanced protections of the pools. But the NRC deemed “the possibility of a terrorist attack...speculative and simply too far removed from the natural or expected consequences of agency action.” So nothing was done—not even the provision of backup water-circulation systems or emergency power-generation systems. The plants of that design also store highly radioactive spent fuel in pools outside the protective containment structure that surrounds the reactor itself. Opponents of nuclear power have warned for years that if these pools drain, either by accident or terrorist attack, it could lead to a fire and a catastrophic release of radiation. The nuclear industry says fears about the storage pools at U.S. plants are overblown because the pools are protected and, even if fuel is exposed to the air, the chance of a fire is incredibly small. And with limited information being released about conditions at Fukushima, the status of spent fuel pools is uncertain. At Fukushima, these tanks are attached to the outside of the reactor’s containment structure. The pools are deep – typically the fuel lies under 25 feet of water. Although the concrete-and-steel containment is designed to trap radiation leaks, there is no such protection for pools outside. Many plants have been operating for 20 years and have tons of used fuel in cooling pools. The concern is that if the water in the pools ever drops too low, the zirconium cladding that holds the radioactive fuel pellets would begin to heat up and eventually burn. And if it did, the smoke from the fire could carry radiation away from the plant because the pool is outside the containment. “People should be very concerned because the NRC [Nuclear Regulatory Commission] has acknowledged that spent fuel pools that are not located inside the containment have the potential to cause catastrophic accidents,” said Diane Curran, a lawyer who has represented environmental groups and governments in challenges to fuel storage plans. After the Sept. 11 terrorist attacks, Congress asked the National Academies to study the vulnerability of spent fuel to a terrorist attack. The report found that the vulnerability of the spent fuel to fire depends on how old it is and how it is stored. As the fuel ages, it cools, so it becomes less susceptible to a fire. “The industry standard is that fuel that is older than five years can be dry-stored,” said Kevin Crowley, director of the nuclear and radiation board for the National Research Council, part of National Academies. The report recommended that the nuclear industry take steps to decrease the vulnerability of the storage pools to fire. Some of those steps are classified, Crowley said. But he said others, like making sure there were fire hoses or spray systems above the pools, were pretty simple. The nuclear industry disagreed with the national academy about the vulnerability of the spent fuel to a fire. It's disturbing that people within 30 km of Fukushima are being told to "stay inside, shut doors, close windows, try not to breathe air" as a response to predicted radioactive dispersement from the plant. This is the same sage advice that FEMA advises us in the US for radiological, biological, and chemical aftermaths of attacks or accidents. Duct tape and plastic. We, the people, should be outraged at how money is being from Wash DC on the "war on terror" and NOT on a basic means of protection. Please check out the above link, contact your political reps or the media, demand this be funded and made available for us. Excellent work. We have added you to our blog roll. Much appreciated. Very fine piece. Jct: 40 years of spent fuel rods still to hit the skies. Just like in Canada where we have no way to get rid of our old nuclear fuel cells just sitting there waiting for an accident to fill our skies with death. The curse of the Rothschilds. "Now I am become death.....The destroyer of worlds"